Rated 4.7 out of 5 stars by past guests! "Very nice tour indeed... 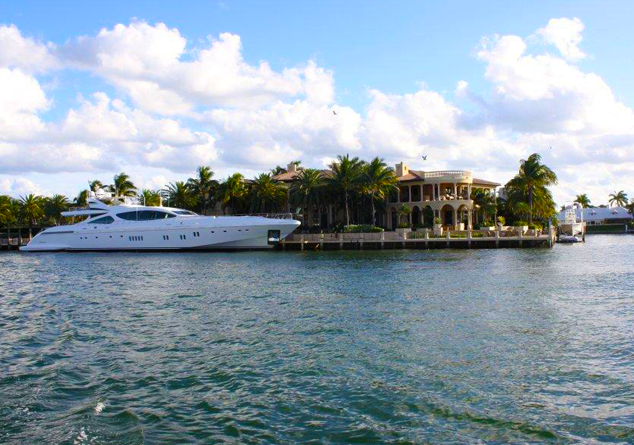 The homes and yachts on the water are breathtaking and a sight to see! Would certainly recommend this tour to anyone." - Manente"
AVOID THE LINE AND SAVE $$! 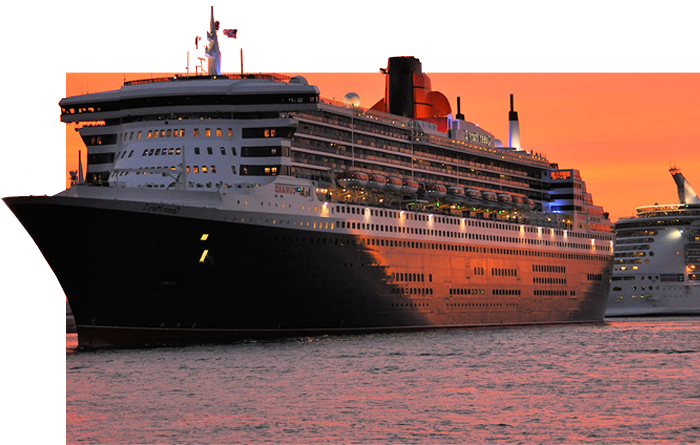 Cruises may sell out in advance! 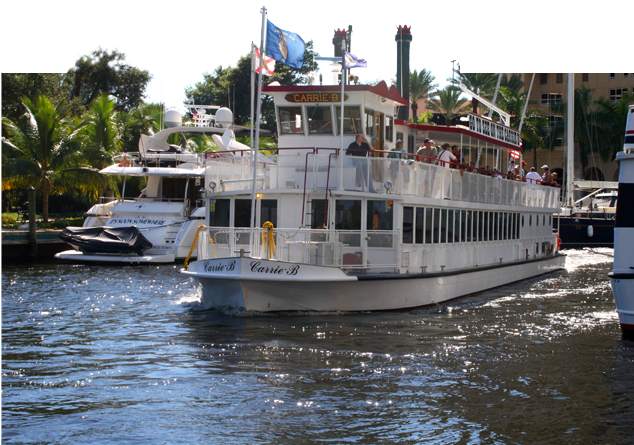 The Carrie B runs three daily narrated sightseeing cruises of Fort Lauderdale, departing year-round from downtown Ft Lauderdale’s New River Docks. We take you along the Intracoastal Waterway and into Port Everglades - home of the world’s busiest cruise ship port. 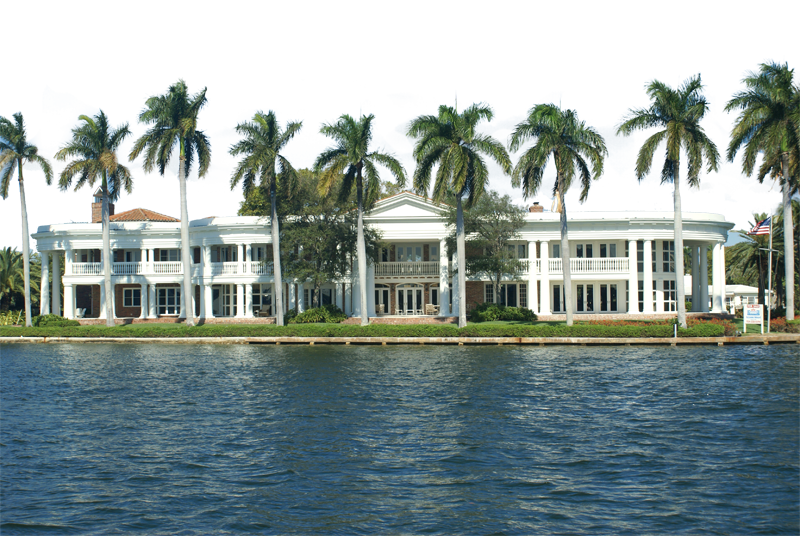 You will see the elaborate mansions and celebrity homes of Millionaires Row and you’ll get up close to the massive yachts docked outside these homes and at Bahia Mar Marina, Hyatt Pier 66 and the Hilton Fort Lauderdale Grande. 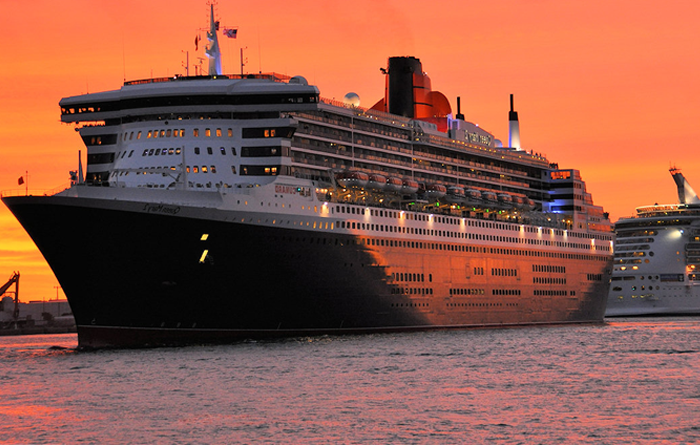 We’ll take you by the ever-changing gallery of the world’s largest cruise ships in the world. The photo opportunities are endless! During your tour with us, you can choose to lounge on the gorgeous sun deck on the upper level or enjoy the air conditioned comfort of the main cabin. We offer food and beverages on board at our full bar for your convenience. 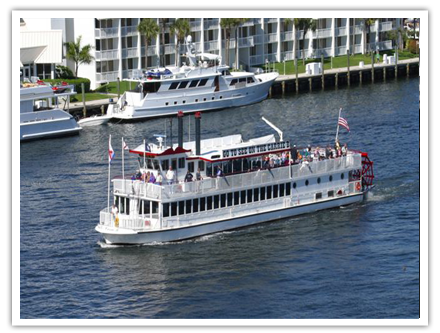 See for yourself why people call the Carrie B boat cruise one of the best things to do in Ft Lauderdale, FL. We have received phenomenal customer reviews, high ratings on Trip Advisor, plus continual great reviews in various local publications such as New Times of Broward & Palm Beach and GO Riverwalk Magazine. Our sightseeing trips are repeatedly deemed one of the highest quality cruises around Fort Lauderdale by many of our customers! Definitely make time in your plans to visit Fort Lauderdale’s famous Las Olas Blvd before or after your sightseeing cruise and you’ll experience the best in fine dining restaurants, shopping & other activities! 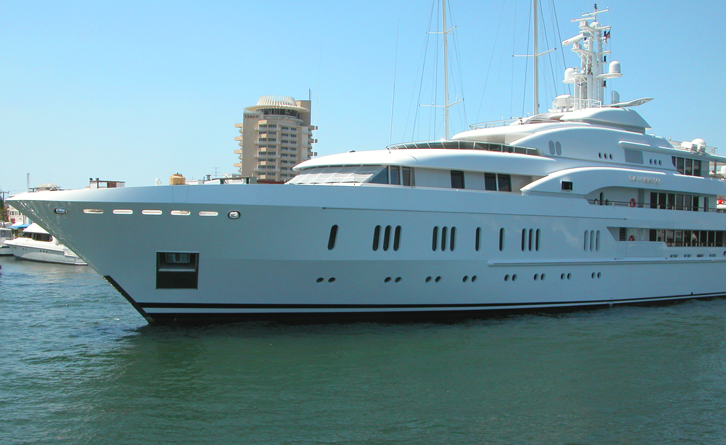 We also offer a variety of private charter options, from corporate events, team building and birthday parties to more formal occasions such as a Fort Lauderdale wedding, anniversaries and reunions. We can also accommodate any private holiday party for you and your group. Charter us for the annual Winterfest Holiday Boat Parade and you and your group can be a part of the action, not just a spectator! You spot a friendly crew member under the blue covered canopy and he waves you over, checks you in, and tells you to proceed right on board. You board the Carrie B and find yourself in the main cabin – an enclosed, spacious, air-conditioned space with ample seating and a full-service bar. 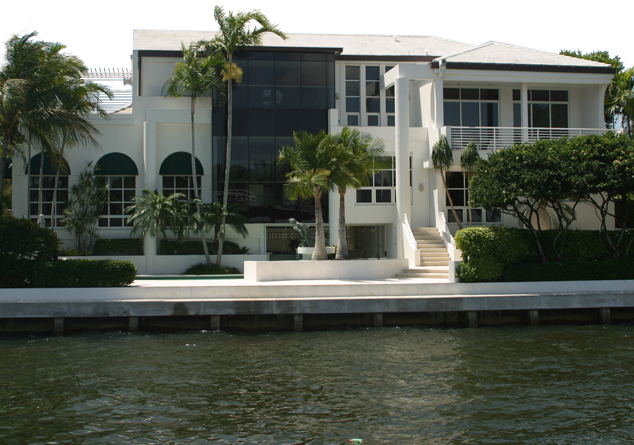 The large picture windows are perfect for viewing the gorgeous Ft. Lauderdale waterway scenery; they are quite inviting - as is the crisp, cool air - but the lure of the Florida sunshine is too much and you decide to head upstairs. Once you step out onto the open-air upper deck, you are faced with a wonderful choice - seating in the relaxing warmth of the Florida sun or selecting a spot under the expansive canopy providing copious amounts of shaded seating. There are also ideal viewing areas around the pilot house that make you think of re-enacting a “king-of-the-world” Titanic moment. 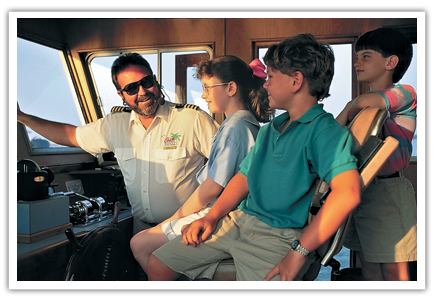 You choose your seat, send your companion for refreshments and the boat tour gets underway for an on-time departure. 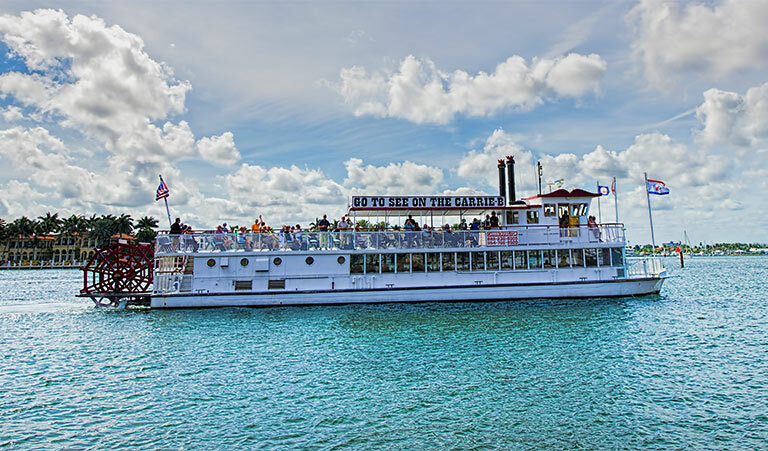 The captain greets you over the PA system and you immediately realize the Carrie B has truly invested in their sound system – unlike typical sightseeing tour boats, you can actually understand every word he's saying - how refreshing! He smoothly pulls the Carrie B away from the dock, executes a flawless 180-degree turn and gently gets underway. The ride is so stable, you barely realize your moving. 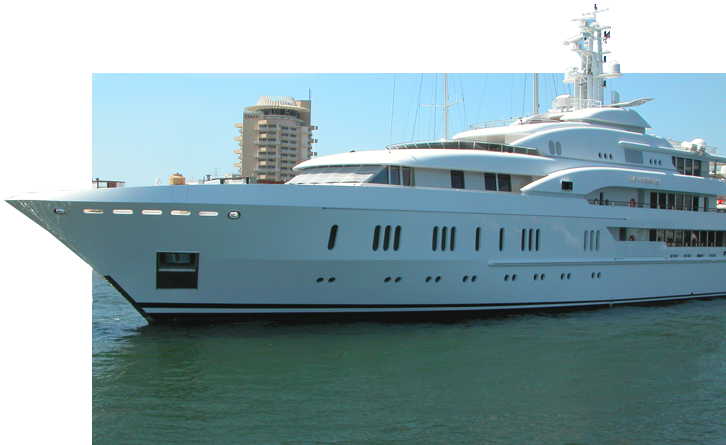 Your Fort Lauderdale tour begins with narration about the luxurious homes (indeed, mansions) and magnificent yachts that saturate the many canals of the New River. You then ease into the Intracoastal Waterway, glide past the Hyatt Pier 66 and Bahia Mar Marinas & Resorts, under the 17th Street Causeway, and into Port Everglades, home of the world's busiest cruise ship port. You are definitely enjoying the calm, smooth, ride on these protected waters as you glide along your tour. Wow - it's amazing just how large these cruise ships are! Depending on the day of the week and the time of the year, there will be anywhere from a few to many colossal vessels in port, from all parts of the world. These floating, self-contained, fully-functioning mini-cities just boggle your mind. Your captain tells you all about the current denizens of the port and point out interesting features of the various ships. You may be one of the many cruise ship passengers who have chosen to enjoy a boat ride on the Carrie B on your arrival or departure day. The Fort Lauderdale airport and the cruise ship terminals are so close – just grab a taxi to the Carrie B. We offer the convenience of storing your luggage on board while you enjoy the sights & attractions. Seeing your cruise ship from this perspective adds a whole new… perspective! Would you like to know more about the specific sights - the homes, the yachts, and the cruise ships - we see on Carrie B's "Venice of America" Sightseeing Cruise? Then make your way over to our Fort Lauderdale Daily Sightseeing Cruises page for sight-specific details. And buy your sightseeing cruise tickets in advance. Remember to use the promotional code CBWEB to save.